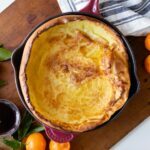 There’s no need to make an ordinary pancake when you can make this extraordinary citrus Dutch baby pancake! The ingredients are quite simple and it’s perfect when topped with a homemade berry coulis sauce! Place a 10-inch high-heatproof skillet in the oven and preheat to 450 degrees Fahrenheit. While the skillet is heating prepare the Dutch baby. In a blender, combine the eggs, skim milk, orange zest, orange juice, sugar, and flour. Blend on high one minute until completely smooth. Rest the batter in the blender and prepare the coulis (fruit sauce). When the coulis is made, remove the skillet from the oven and add the butter. Once the butter is melted, pour the batter in the skillet. Immediately return to the oven. Bake until the sides have mushroomed above the sides of the pan and the center is golden but still custard-like, 20-23 minutes. Remove the Dutch baby from the oven and serve immediately with the prepared sauce and fresh berries. Bring to a simmer over medium heat. Slowly cook until the berries burst and release their juices, 5 minutes. Stir to break down all the berries and create a sauce, 3 minutes. Remove from heat and pass through a strainer to remove all the pulp and seeds. Press the pulp to extract all the juice and set aside.